Den Bakker Dustcrusting technology b.v., (dbd global), is an expert in dust control and prevention. Dust is everywhere. It is not always visible, but often creates problems. Ever-more-stringent environmental legislation regarding dust control is creating difficulties for many companies. Den Bakker Dustcrusting technology specializes in the control of dust, not only by cleaning areas that are already dusty, but also and most importantly working to ensure that dust does not become a problem in the first place. Being heavily involved in this matter as a contractor for some 30 years, the company has developed a range of solutions to help with dust control, including a range of specially designed water spraying vehicles each having particular capacities and performances to suit the needs of a specific site or condition. The constant desire to improve led to the development of a very effective method to control dust on most of the sites where it is needed: the Dustcruster® technology. Dustcruster liquid® is an inexpensive and environmentally friendly (natural) product. After spraying onto coal and iron ore stacks, it forms a real ‘crust’. This crust safeguards the stockpiled product from being lifted by the wind and transporting dust, and lasts for a very long period. Rain barely affects its effectiveness. Only after digging into stockpiles is it necessary to repair the crust by spraying on a new layer at the disrupted area. Dustcruster liquid® has also proven to be a very effective means to settle large sand areas around infrastructural projects and has successfully been used to prevent the escape of dangerous fumes during soil cleaning operations. Dustcruster liquid® is mixed in a special installation. It has proven to be a better solution than all other products because of its longer lifetime. Dustcruster liquid® can be transported to most locations all over Europe where it is then transferred into large containers, equipped with stirrers and sometimes even with heaters to allow work at near zero conditions. The company sells and rents the containers. For the spraying of Dustcruster liquid®, specific spraying trucks are required, mostly agri-tractor towed. In order to reduce transport charges and to allow the use of the technology on a world scale, Den Bakker Dustcrusting b.v. has created Dustcruster dry®. Dustcruster dry® is a mixture of different fibres which are crushed into pellets and are transported in FIBC's or containers. On location, the Dustcruster dry® pellets are dropped in a special mixing tank with clean water where they transform into a liquid suspension, Dustcruster liquid®, ready for use. Here also, special spraying trucks are required to successfully cover the coal/iron ore stock piles creating a tough and long-lasting crust. Best known are large-capacity, far-reaching water spraying guns. These are most suitable along places where there are frequent loading and unloading activities. 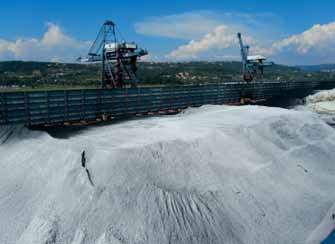 It is, of course, most efficient to use as little water as possible to settle dust, so the company has developed a special system to prevent forming of dust along coal and iron ore conveyer belts. These jets create a very fine water spray resulting in maximum dust settling with minimal water. An added bonus is that the road alongside the conveyer is sprayed at the same time. Dust control when handling/crushing wood and stone is particularly problematic, as using water can cause humidity problems. Den Bakker Dustcrusting has created a system where only a small amount of water is needed to create a large amount of foam. This larger foam surface is an excellent dust collector, and results in a better dust-free working environment. The foam is created using special equipment that requires only 98 litres of water for a maximum of 2 litres of foaming agent to make a staggering 5,000 litres of foam. The foam is quite tough and long lasting. Depending on the actual activities performed, the foam can last anything from 3 to 12 days. Den Bakker Dustcrusting technology has gained vast experience in the control of outdoor dust and uses very advanced systems, stationary as well as mobile, with natural fibre and/or with polymers or other products, and which can operate under the most severe conditions, inclusive of frost and strong wind.